How is it done? Why laminate? 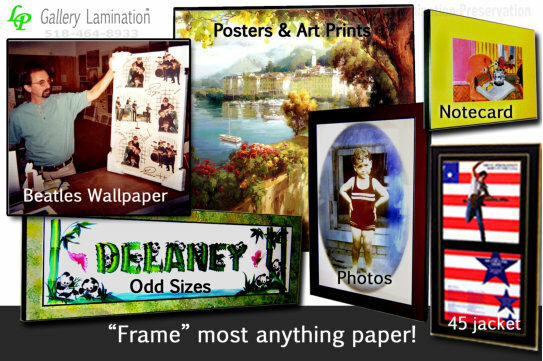 What is Gallery Lamination for? Who is it for? How much does it cost? 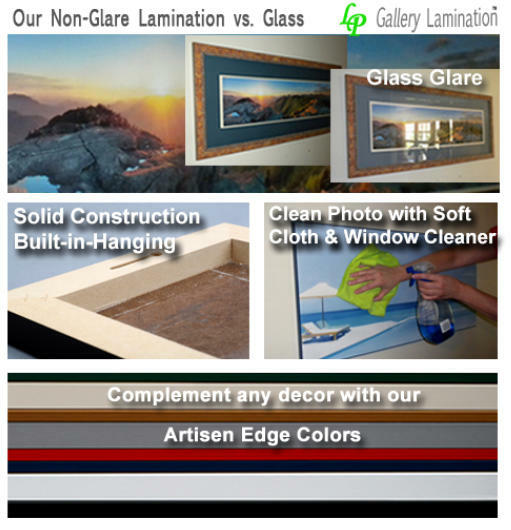 Custom Gallery Lamination just for you! The process takes us about 2 weeks! plastic encapsulation you put on school papers. effect. It is not Museum Mounting. treasures without Glass or Plexi. Details - How is it done? Matte (Non-Reflective) - True dead matte non-glare. Smooth finish. Satinex - Slight shimmer pops & enhances colors. Slight texture. Canvas Texture - Gives your item canvas appearance. Heavy texture. 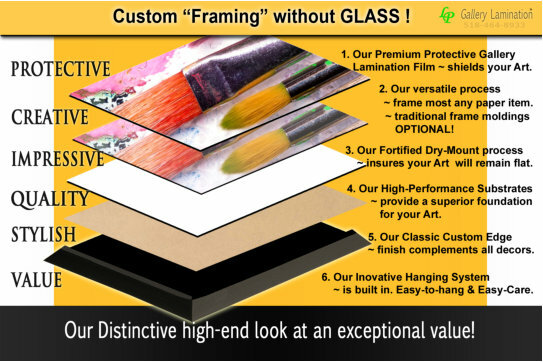 ANSWER - Because of the advantages of our process offers you over traditional framing. lamination film. It will look fantastic for years to come. Glass Free - No Glass. No Glare. Non-Glare - Finish is standard on all our styles. Impact Resistant - No Glass. No Breakage. Always looks Clean - Finger print, dirt & dust resistant. Easy Care - Window cleaner & soft cloth right on your photo. High Image Visibility - Enhances your photo. No glass distortion. Solid Construction - Eliminates frame sagging. Resistant to Humidity - No Prints sticking to glass. High Performance Substrate - Eliminates buckling & bowing. Fortified Dry-Mounting - Prints stay flat. No cockling (wavy prints). Preserves & Protects - Permanent process prevents document fatigue. Easy-to-Hang built in hanging system - No complicated picture hooks. Artisan Edge Colors - Perfectly complements your print. Modern or Traditional look - Décor friendly. Goes in any room. Fresh & New - Rejuvenates photos that have become old & tired. Timeless - Styles change. No décor limiting mouldings. Odd Sizes Welcome - No up-charges for unusual sizes. Versatile Process - Can combine lamination & a frame moulding. Variety of Options & Styles - Allows you to express yourself. you would never think about framing. 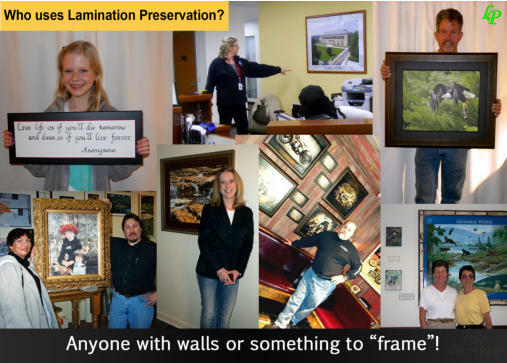 What is Gallery Lamination for? more! Think outside of the “frame”! things you never thought you could or would. organization, your retail shop or business. individual decorative needs for your home. marketing and displays personalized to reflect your company’s strengths. training, individualized support, sales samples, displays, brochures, ad templates, etc.. Improve your bottom line! is LESS than others “50% off” sales. your vacation. Building your Motorcycle. Odd sizes don’t cost more & Spending more does not mean you get more. 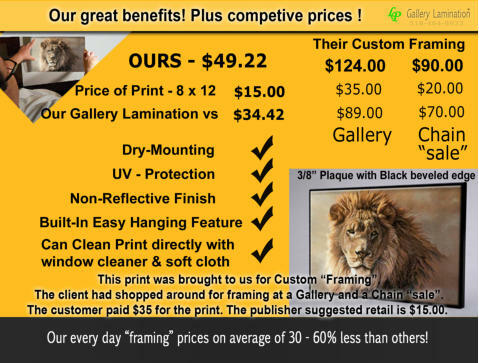 Our pricing is made up of size categories and lamination styles. Cost is determined by measuring your document & rounding up - length x width = surface area. The product you select determines the cost. With the exception of adding options you may like, it is as simple as that.